Lots of things have been going on, and while I have photos of many of the items we've been working on, I haven't made time to download them and share with you. We are still currently without any drywall, as we failed our first "final" inspection and had to have our builder fix a few items before we could have insulation put in, and then have the place drywalled. Bruce, our builder, was there last week working on many items for the inspector. The house is very much naked right now - down to all of the studs in each room, and all new electrical wires just about everywhere. We have been working on the house just about every weekend since we closed on November 5th. That's 21 weekends in total spent at the house taking out every single nail (and there were thousands! ), double layers of drywall, crazy walls that made no sense (and were not original to the home), two bathrooms which were both so gross, you'd never want to use them and taking out the asbestos tile (Greg did this solo, with appropriate clothing/face mask/etc.) in both the garage & basement. Seriously, I cannot tell you how much work that man did on this home. It's truly been a labor of love, and we are thrilled to finally be putting our current home on the market in the coming weeks - just in time for spring, when our yard is in full tulip bloom, and all the other plants start filling in. Now that our part of the home demo is coming to an end, we have our current home to get ready to sell. While it's in great shape - we have a small list of minor things to do. This week, Greg has worked on recaulking the bathtub - no idea why he didn't do it sooner; it looks 1000x better already! A few holes to fill in the walls, a few paint touch-ups to work on, and of course, the major de-cluttering & packing up of personal items, and we should be ready to list and hopefully(!) sell this home quickly. 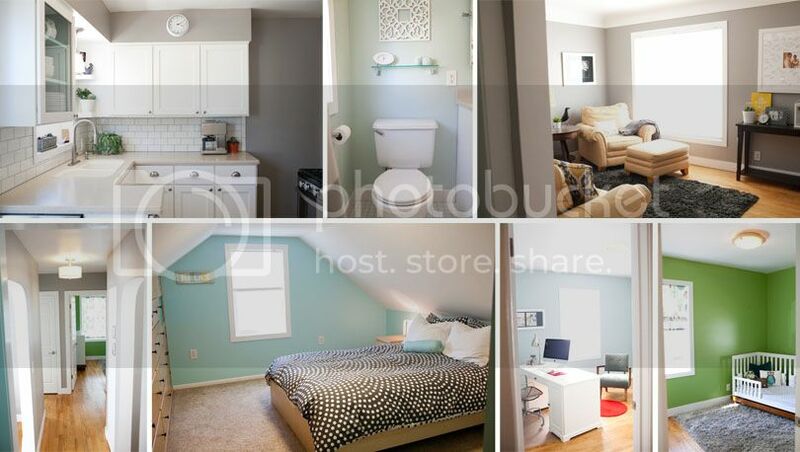 A friend came over to grab some professional photos of each room last Wednesday, and they look fabulous! If you know of anyone looking for a home in Grand Rapids, check ours out here: LouiseStreet.Blogspot.com. Here's a peek at what the current house looks like - all ready to sell to the right buyer! As of now, we hope to be all moved in by June 1st. I honestly have no idea if this is going to happen, but people keep asking me, and that's the date I keep throwing out. That is in 7 weeks, and might be crazy soon, but I am hoping it happens. Work gets much busier for me in June, and I'd love to have my office and whole life reorganized in Grand Haven before July 1st! Good luck selling your old house! Looks like a super-cute house for the right family.